box (15.25 oz) Betty Crocker™ Super Moist™ white cake mix. Preheat oven to 350° F. Spray two 7-inch round cake pans generously with nonstick baking spray. Set aside. In a large bowl, mix together Betty Crocker™ cake mix, egg whites, oil and cold water. Stir until mixture is well combined; it’s okay if a few lumps remain in the batter. Spoon batter into prepared cake pans and bake as directed on box. Allow cakes to cool completely, then remove from cake pans and place on a parchment-lined rimmed baking sheet. In a medium bowl, whisk together strawberry gelatin and boiling water until gelatin completely dissolves. Whisk in 1 1/4 cups of pink champagne. Place mixture in fridge for 10 minutes to cool. While the gelatin mixture is cooling, use a straw to poke 12-15 holes in the top of each cake round. Drizzle the champagne gelatin into the holes. Place in fridge until gelatin is set, about 1 hour. While the cake is cooling in the fridge, prepare the buttercream icing. In a stand mixer or large bowl, beat together butter, powdered sugar, and half of the remaining pink champagne. You want to add just enough champagne to make the frosting about the texture of soft butter, so start with a small amount and add more only if needed. The frosting should be fluffy, with firm peaks. Tint frosting to your desired shade of pink. Remove cake from fridge. Gently arrange one layer on a cake stand. Spread the top of the cake with a thick layer of icing, then place the second layer of cake on top. Fill a large icing or zip-top bag with the remaining frosting. Snip the bottom (or corner) of the bag off to make a 1/2-inch wide opening and pipe the frosting onto the cake in large, swirling circles to create a “bubbly” look. Sprinkle with edible pearl dust or edible glitter. Refrigerate for 2-3 hours before serving. Remove cake from fridge 20-30 minutes before serving to allow cake to warm to room temperature. Use a sharp knife to cut into slices and serve immediately. Return any remaining cake to the fridge until ready to eat. 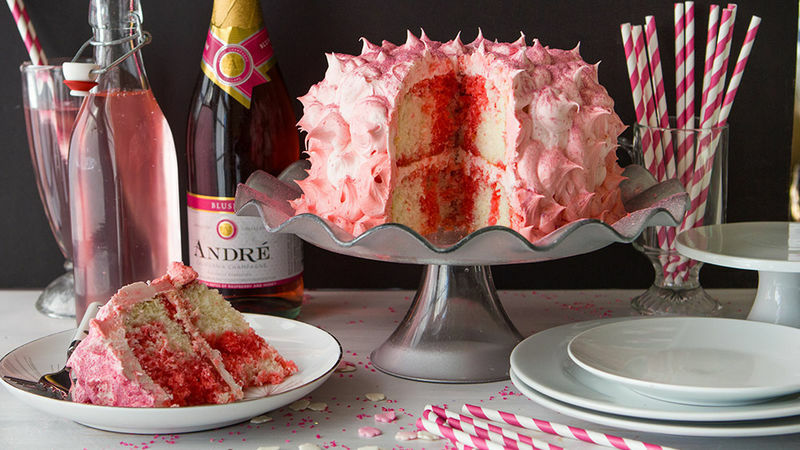 Yes, there's really pink champagne in this gorgeously delicious cake!Perfect for New Year's or any celebration that requires a showstopper of a centerpiece dessert. 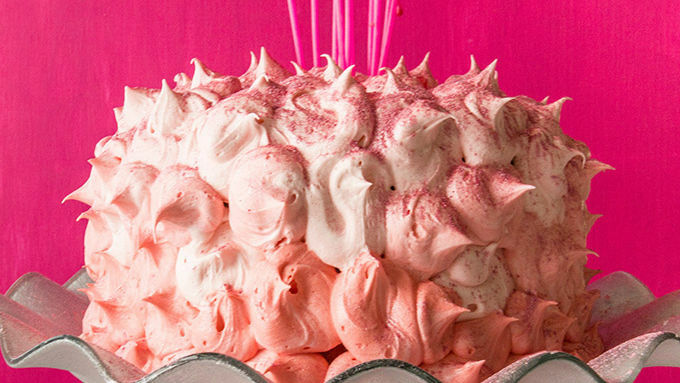 So break out the bubbly – and use it to make this pink poke cake. It all starts with a simple box of white cake mix. Bake according to package directions and allow to cool completely. Then transfer your cake rounds to a parchment-lined rimmed baking sheet and poke 12-15 holes into each round with a straw. A little splash of champagne-spiked strawberry gelatin, and you’re nearly there. Now, let’s take a moment for a Poke Cake PSA. It's very important to take the cakes out of the cake pans before pouring on the gelatin mixture. Sure, keeping them in the pan would keep the the gelatin from spilling all over the world. But, it also makes it plum impossible to get the cakes out of the pan, on account of the supermoist stuckedness of the gelatin. That's why we like to do this part on a parchment-lined, rimmed baking sheet to contain the mess. Follow these instructions to a “T” and you’ll be a-ok, with two purty cakes ready for frosting. And speaking of frosting, how about we just pipe pink boozy buttercream in bubbly little rounds all over the outside of our cake? A zip-top bag or icing bag makes this a snap. Just cut the top to create a 1/2-inch hole, and then pipe the icing round and round. We like the effect of frosting "bubbles" to match the bubbly-spiked cake, but you can also frost the cake normally. It will taste just as delicious! Finally, sprinkle with edible pink pearl dust. You can find this stuff in the cake decorating section of most craft stores. To get giant, perfect slices, this cake works best when refrigerated all along the way. Keep it in the fridge to keep the moist and tender cake from melting underneath the weight of your buttercream. Slice the pieces with a super-sharp knife to ensure a gorgeous cut. Then, grab a fork.